Furniture Elevator | No Need To Hoist Your Furniture We Will Zoom It Up! Why risk having your wall scraped and your appliance/furniture too? In half the time through your window or terrace we’ll have it done for you! 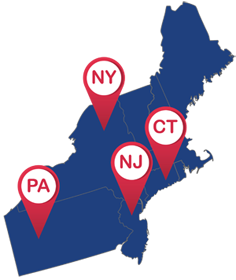 We work with the leading movers in the Tri-State Area. We also do moving for residential homes, buildings, contractors and appliance centers. Anything to make the move effective & efficiently. We carefully plan your move and bring in our equipment and personnel as the truck rolls in to your location. Your appliances, parcels, furniture, large and heavy materials are placed straight off the truck onto our hoist, and our personnel lift them up to the elevation required, bringing your items directly into the desired area. When stairs or doorways is restricted, furniture and parcels need to be moved to an upper floor, Furniture Elevator comes in to lift your furniture via the windows. A fully trained operator will elevate comfortably and speedily your items up or down from the premises. Furniture Elevator is able to assure that you will receive a quality service and will do all it can, in order to make your move run as smoothly as possible. We lift from the ground up, moving your stuff from the delivery truck up to the elevation you need. That means you have no hassle of carrying your possessions up stairs, or cramming them into an elevator inside your building. By using our service your possessions will remain intact. Furniture Elevator avoids scratches and breaks of your precious possessions while hoisting them up and prevents damages to your freshly painted walls . Satisfied customers means their move was conducted swiftly without damage to any of their appliances, materials, or possessions. Our satisfied customers will confirm how swiftly and smoothly their move was completed. How about Some Fun Facts about our Hoist? No need to worry about damaging your furniture, we will ZOOM IT UP in no time! The 9th floor tenants of this building in Pennsylvania purchased a large sofa which had to be delivered to their apartment. The sofa was large, and did not fit into the interior of their elevator. The sofa was heavy too. But the residents wanted just this sofa for their living room and they wouldn’t settle for anything smaller. Furniture Elevator was called upon to assist in the delivery and do the lifting. In just 10 minutes the sofa was lifted off the delivery truck, and placed directly into the 9th floor apartment. No hassle, No damages, No manual lifting. Furniture Elevator has the expertise to lifting very large items to the upper floors of hi-rise buildings. When appliances and large furniture need to be lifted to high elevation, you can count on us to do the lifting. At these projects, Furniture Elevator actually lifted over-sized furniture in short time, instead of having the furniture stores dismantle the furniture pieces and carry them up piece by piece. A family move to a new residence was handled by Furniture Elevator. We coordinated our arrival together with the moving company, and worked alongside them as all household items were placed on our lift, and we brought them up to the 3rd floor in less than 2 hours. The move was completed quickly, and no items were broken or damaged. Furniture Elevator was hired to lift new central air conditioning units to the 9th floor landing of this 10 story building. In a matter of minutes, we lifted all units required and they were placed on the external landing at the 9th floor. Delivery was completed quickly and successfully. Furniture Elevator was called upon to lift materials to the rooftop elevation of this construction in progress. 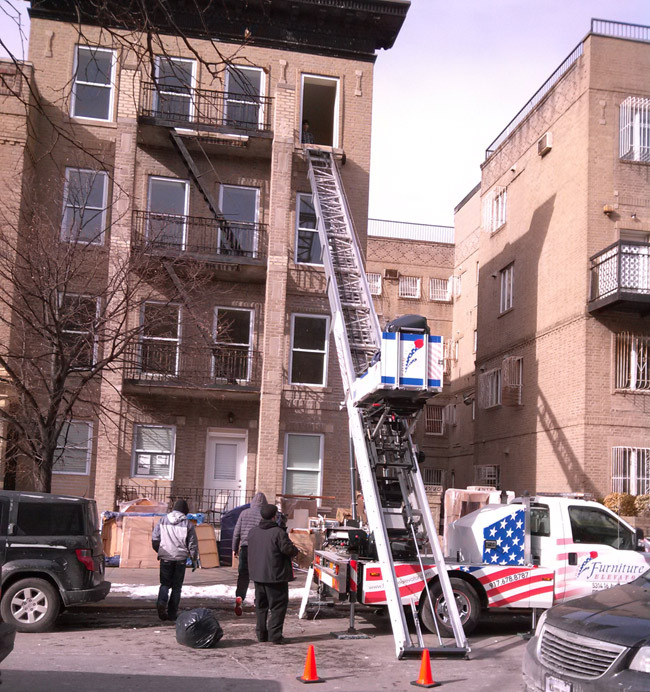 Using our external hoist, we lifted a truckload of shingles and construction materials to the rooftop area. The contractors saved time, money and the effort of their crew as we hoisted their materials in only two hours of time. A Day’s Work at Furniture Elevator includes a combination of heavy lifting at various locations. 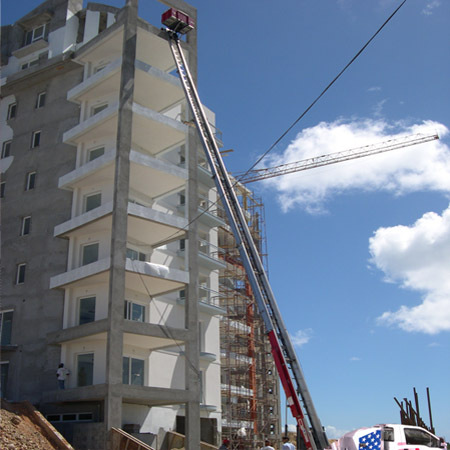 Lifting appliances via the windows to deliver them to retail customers, moving a household’s belongings to their new residence, lifting large furniture to a loft condominium, and construction material lifted to the rooftop of a new building. All lifting with the innovative Furniture Elevator instead of manually lifting or hoisting. By lifting large and heavy items via our lift and moving large items into an apartment via the windows, you save time, money and labor. In the interim your items remain safe from damage; your walls free of scratches. A move to the 4th floor of a non-elevator residential building is a tedious task which oftentimes involves many men, hours of trekking up and down stairs, and traditional pulley style hoisting of furniture and appliances. Furniture Elevator hoisted up a family’s possessions in just 1 hour. We lifted their appliances, furniture, boxes of housewares, and all personal possessions through the window directly into the 4th floor apartment. The move was quick and successful with no damages. Planning your move involves strategy. We work hand-in-hand with movers, coordinating the move from your location to your new dwelling. Our dedicated operators are experienced in the field. They are trained to operate the Furniture Elevator carefully, hoisting your possessions up safely. We take great care in handling your possessions in a gentle manner. From the removal of your items off the truck, to placing it onto your premises, we take great care in protecting your property. Using brand new equipment means we get the job done right. Our state of the art hoist is newly manufactured and in perfect working order. Work with us with the comfort and knowledge that our work is fully licensed and insured. Creating an account with us for your business is simple. Just set up an account and we’ll be there for you for all your bulky deliveries. Images of the items to be hoisted will be very helpful.